Heat oven to 350°F. Grease and flour bottom only of 8x4-inch loaf pan. In large bowl with wooden spoon, mix flour, granulated sugar, baking powder and salt. Beat in oil, 1/3 cup cider and eggs until smooth. 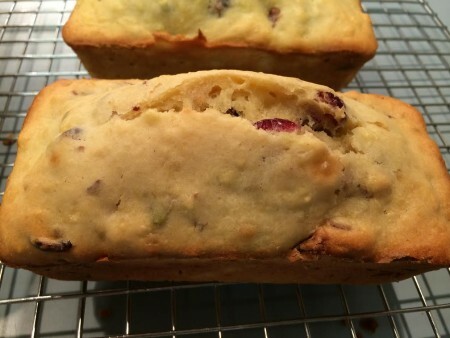 Stir in apple, cranberries and 1/3 cup pistachios. Spoon and spread evenly in pan. Cool in pan 10 minutes. Remove from pan. Cool completely, about 1 hour 30 minutes. In small bowl, mix powdered sugar and enough of the 2 to 3 teaspoons cider for desired glaze consistency. Spread over top of bread. Sprinkle with 2 tablespoons pistachios. 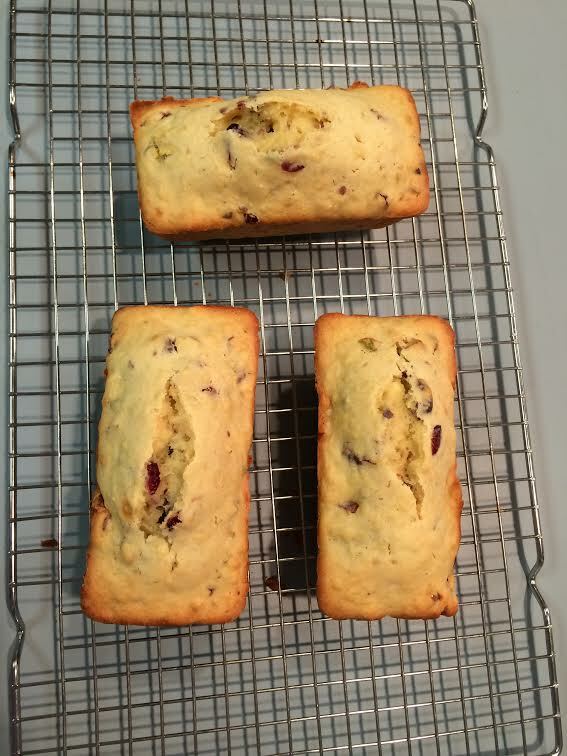 I mixed everything in the Kitchenaid mixer (I love this thing) and then poured it into the mini loaf pan that I have. Using that instead of a regular sized pan I got 3 loaves of the bread out of it. The only change I made to the recipe was using the Splenda Blend instead of regular sugar. Using the Splenda blend I got calories down to around 135 each slice. I baked the bread for less time than the recipe called because the loaves were smaller. The recipe called for a glaze, as well. I skipped that for a few reasons. It was late in the evening and I didn’t want to do it and I honestly don’t think glazes or frosting add a lot to a recipe except for calories! How was the bread? It was really good! It was dense, not dry but dense. I think next time I make this I’d use plain Greek yogurt instead of vegetable oil, and maybe a little applesauce. I liked the mild flavor. There was a touch of sweetness from the cranberries and apple chunks but it was mild. It would be a great recipe for someone trying to watch their sugar intake. 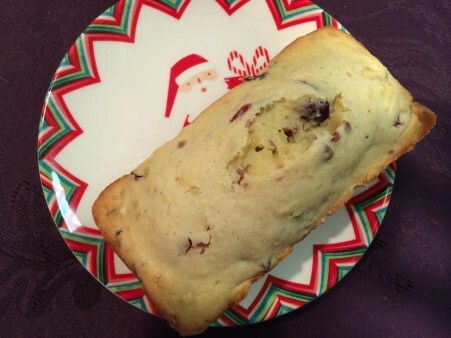 Since I made the mini loaves, I had an extra one that I ended up taking to a friend’s house for her holiday party. 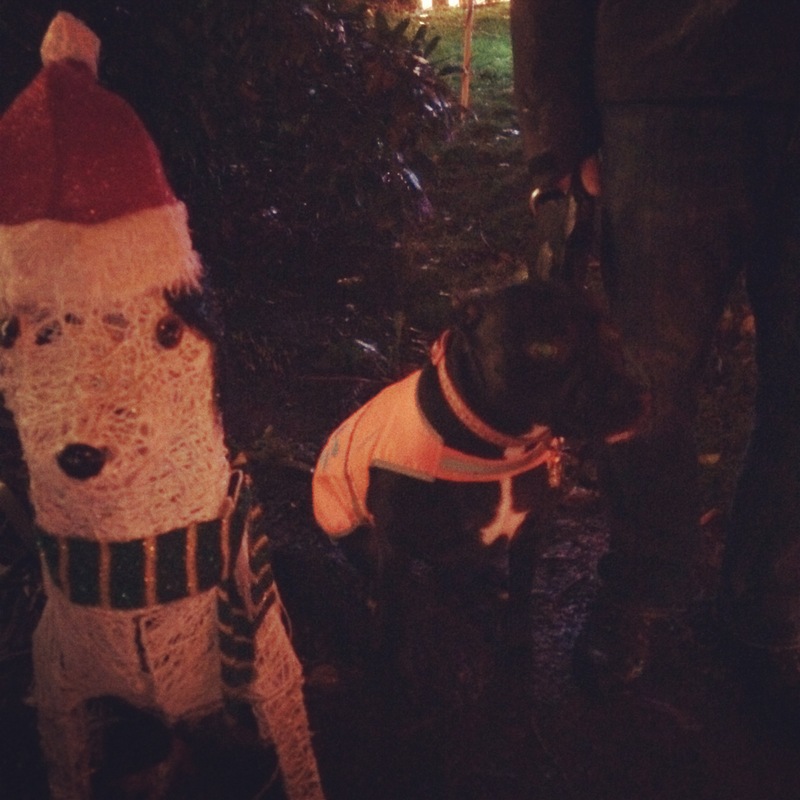 Every few years she throws a house warming/holiday party and then we all go and walk along Peacock Lane. Peacock Lane is a short residential street in SE Portland that gets all decked out for Christmas. It’s actually a requirement for the homeowners to decorate! Since the 1920s, each house in this quaint southeast neighborhood has been decorating for Christmas. Mostly Tudors, the houses are adorned with not only beautiful sparkling lights, but also nativity scenes, rotating Christmas trees and stunningly life-like replicas of Santa and Frosty. 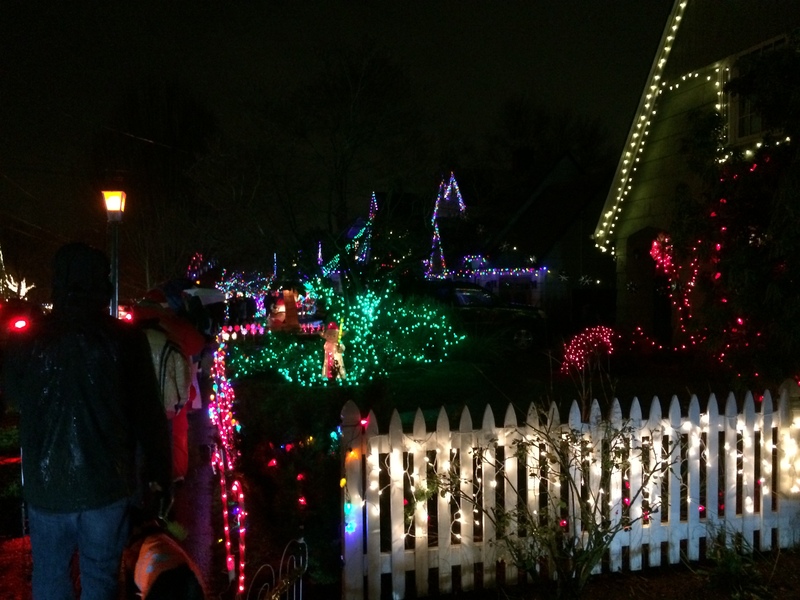 Be forewarned: this is a very popular Portland tradition and the crowds can get quite thick. It is wise to park several blocks away and walk, rather than drive through the area. It’s a fun thing to do to get into the Christmas spirit. It’s not really necessary to do it every single year, we generally go every other year or so. So I took a loaf of cranberry bread and a bottle of wine to Sam’s house and we all hung out, eating (she made these turkey meatballs with a BBQ sriracha sauce that was amazing) and drinking before walking down to Peacock Lane. 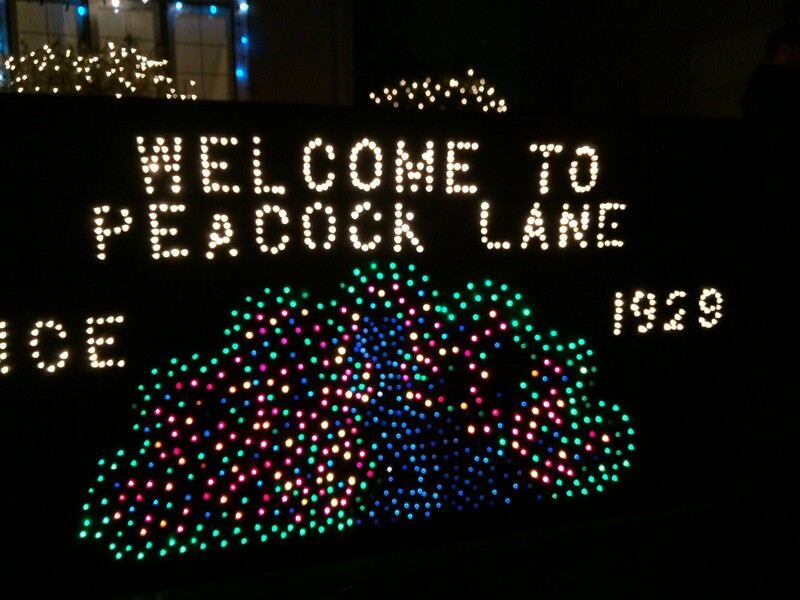 We had a great time at the party and then a bunch of us walked down to Peacock Lane. With Bella! It was raining pretty hard but we still had a good time (and got totally soaked). Bella did a great job! There were so many people that I think she was overwhelmed and so she didn’t bark at anyone. It was great! I’m so proud of Bella! She’s really growing up. She’s not freaked out by strangers as much anymore and I’m excited to be able to take her more places and not worry about her being scared of everything that moves. Anyways, we went back to Sam’s house after walking Peacock Lane, soaked through and through, said our goodbyes and called it a night. All of us were very very soaked. My jacket is still drying out. 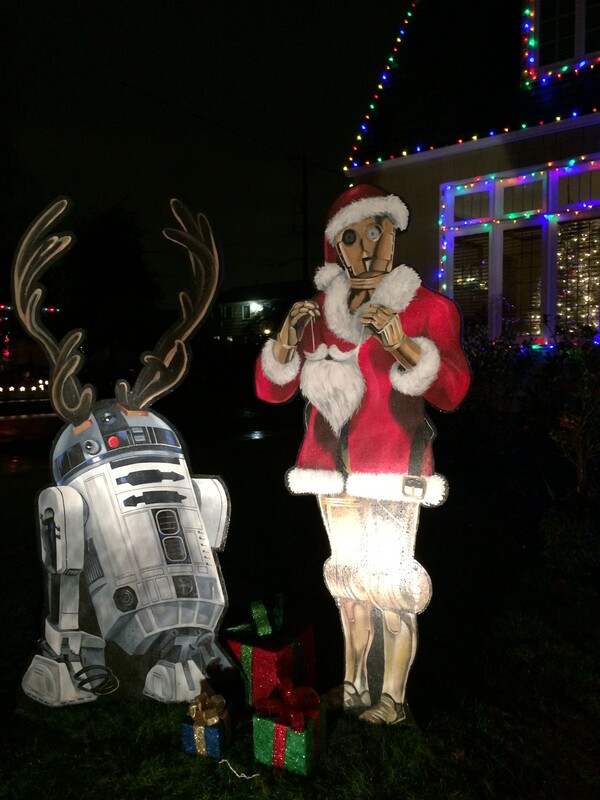 I love the R2 and C3PO! Sometimes I wish I had the gumption to go all out on the lights for Christmas. We put up lights, but not to the nth degree. I think you have to start in October for that. 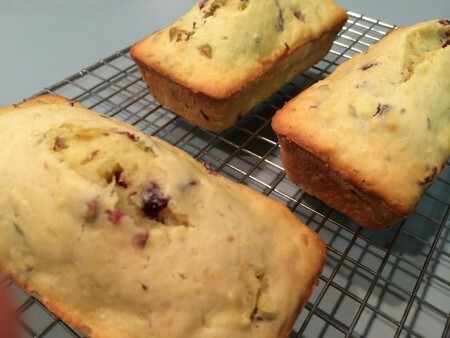 I love cranberry bread or cranberry anything, really! 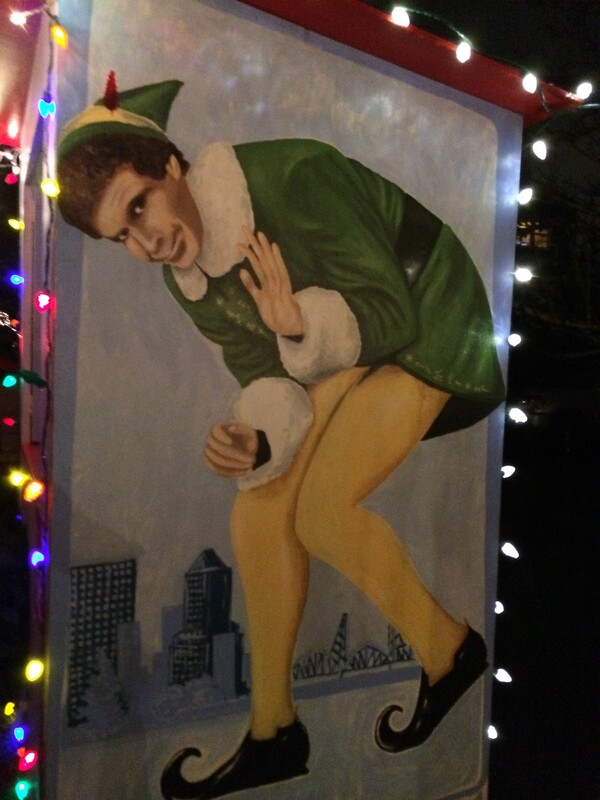 Several houses on our street have gone all out and I feel like we should try and do something next year. We decorate indoors but never outside and it looks so nice when you decorate the outside! I love mini loaf pans. The breads sounds good! Thank you Andrea! Merry Christmas to you! 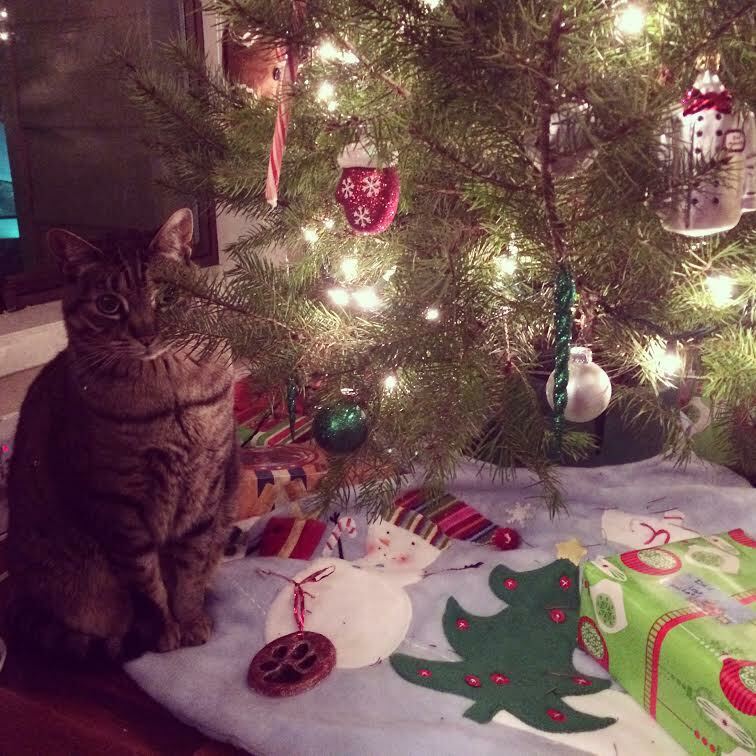 You have fantastic taste in tree skirts. I have the exact same one. Haha! Thanks Sarah! 🙂 Got it on clearance last year! haha, me too! I got a bunch of cute christmas towels for the kitchen as well. Love Kohl’s clearance. Christmas clearance is the best! Pretty much all my decor is from clearance.